The Model 81, priced as an insert with standard insert panel kit included, offers an attractive three-sided Bay-View front, and it's a great choice for heating mid to larger homes up to 2700 square feet. Standard features include durable non-catalytic technology, factory installed variable speed thermostatic blower, removable ashpan, and glass door with air-wash system, and "Hot Shot" air system that creates a super-heated jet of extremely hot air to start a fire really fast. For a 24 caret plated gold door that does not need constant polishing, as does solid brass, add $250.00. 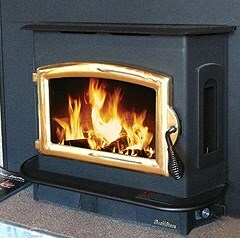 For the Model 81 free-standing stove with Queen Ann cast legs and 6" cast Buck stovepipe collar, add $249.95. Woo Hoo! 78% efficiency means you will use a LOT LESS WOOD! If you want the gold door, HURRY IN! Only one with a gold door, and one with a black door left a this price!